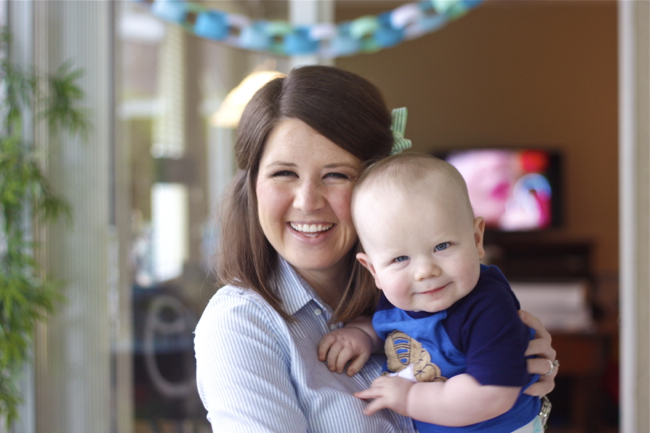 When we started talking about celebrating our little man and his first birthday (I still cannot believe he’s one whole year old), Bryan and I wanted his party to be something everyone enjoyed – his little friends that he sees on a regular basis (who range from itty bitty to 12) and their families as well as our family. 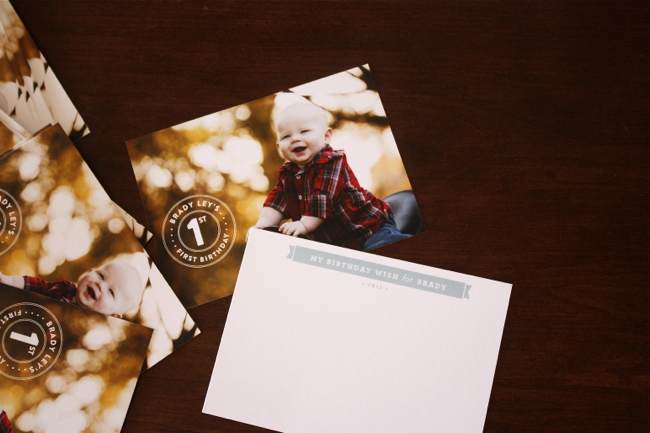 We wanted the theme to be Southern, classic and with the personality of a giggly, happy, sweet little boy. We decided on a “Southern Picnic” (see his adorable invitations here) on our back porch and used bow ties to “tie” everything together (pun intended). 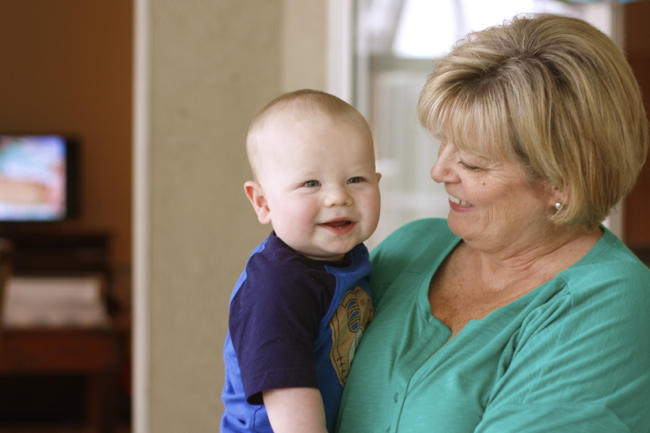 And, of course, as his doting Mama, I wanted every little detail to be “just-so” so that Brady had fun and felt loved, loved, loved. 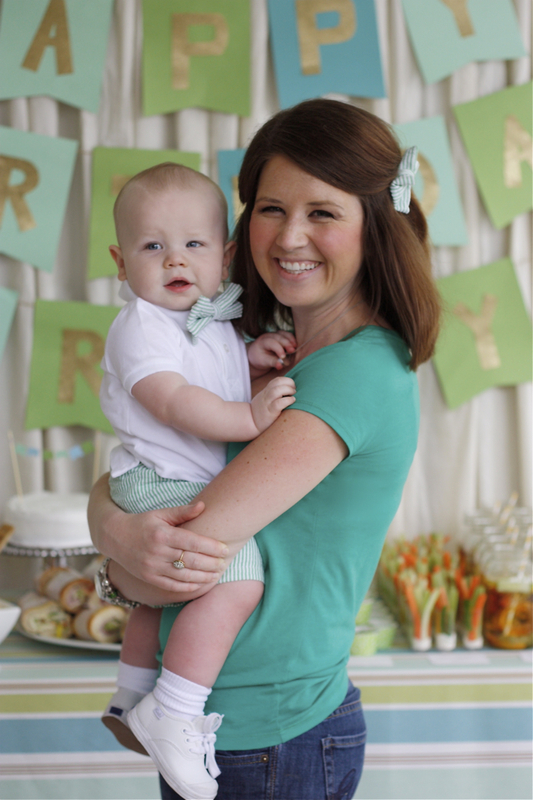 Brady’s first birthday party was full of handmade details, little Etsy-bought details, yummy food and one happy little bow tie’d man. 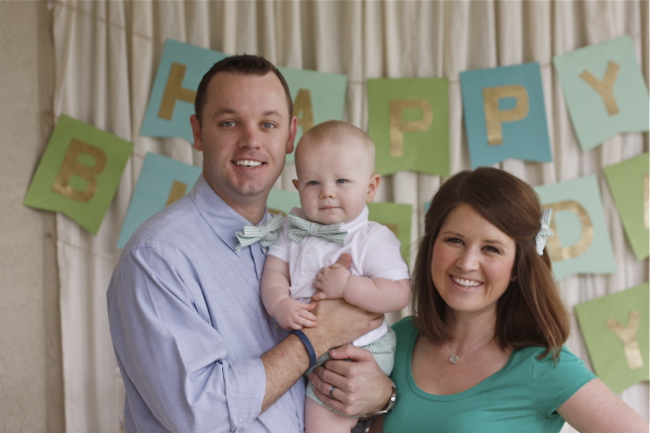 (and handsome bow-tie’d Daddy, I might add). I was so grateful to have my family here to help with the party and to spend a few days before just celebrating little B. The cute little white die-cut food cards you’ll see throughout these photos are from Unique StashNStuff on Etsy. Great place for little cards like this. 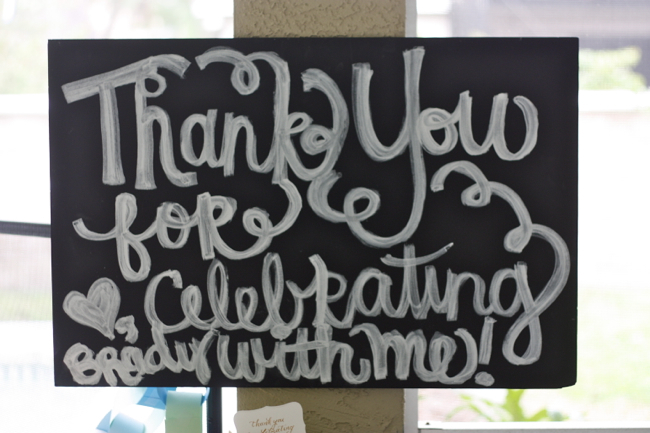 Jessica Ulrich of MJ Paperie (and Jessica Haley Ink) hand lettered each card with a gold pen. Love. Little B posing for the camera with me while we set up. 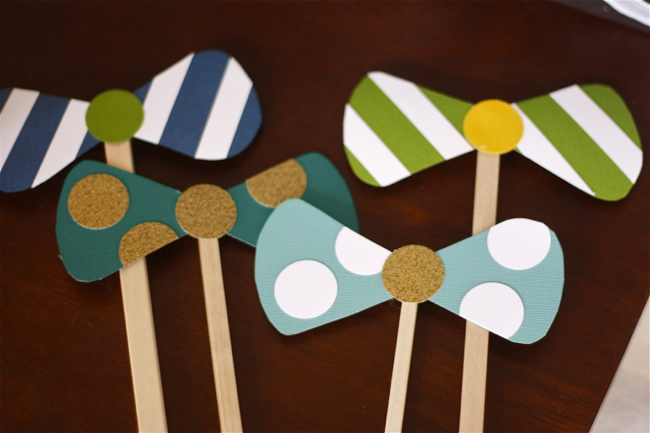 First things first, I used wooden sticks and card stock to make photo props. The backdrop you see in the first image above was muslin I got for 40% off at Joann’s. Thanks to McKay and her sewing teaching skills, I sewed a simple pocket at the top of each piece of 90in x 2.5 yards of fabric. My dad created a wooden dowel to act as a rod that we then fastened to the top of our glass doors. The table cloth is a simple white table cloth paired with a gorgeous fabric also from Joann’s. I based all the colors around this fabric. 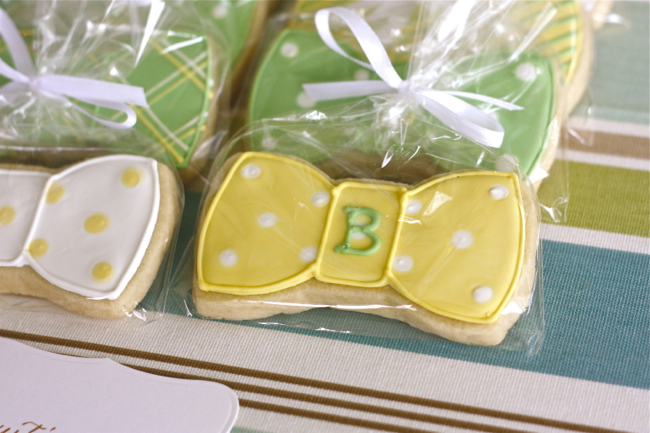 What kind of favors can you give at a one year old’s birthday party that the little guests will really love? BUBBLES! I got this idea from Abby Larson of Style Me Pretty. 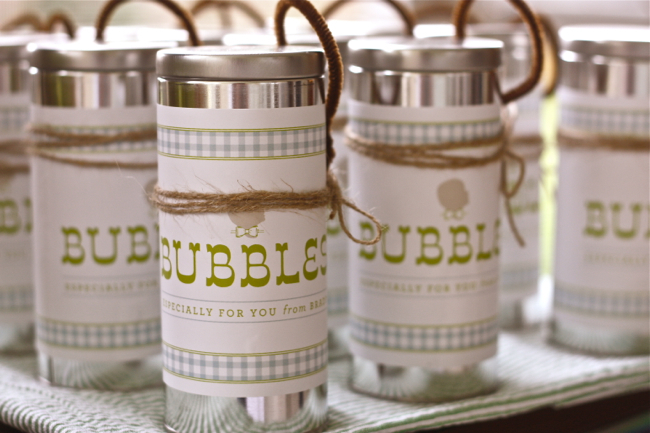 See her feature on Hostess With The Mostess here where she created these bubble favors for her daughter’s birthday party one year. I followed her steps almost exactly and purchased these little canisters from Specialty Bottle (what a GREAT website). I designed the labels and used twine and pipe cleaners to top them off. I bought a giant bottle of bubbles from Target to fill each of them and displayed them on top of green seersucker fabric! Voila! 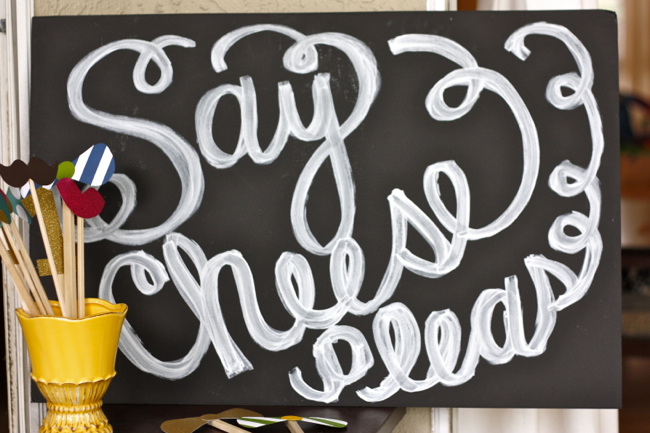 More hand lettering on black foam board. 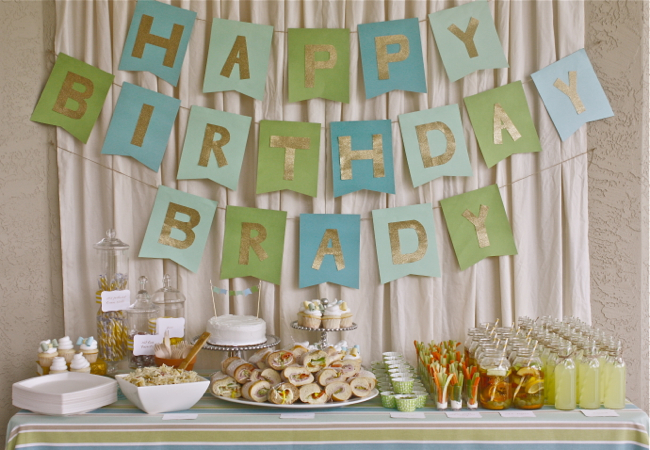 Whoops, I ran out of room for “Love, Brady.” : ) He didn’t mind. 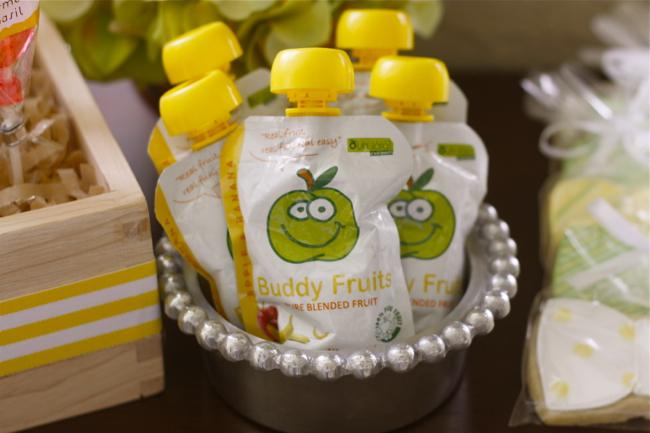 For Brady’s little bitty friends, we had Banana and Apple flavored Buddy Fruits for them to eat. I love Buddy Fruits because they’re easy for Brady to hold and eat himself (like a juice box). Plus they’re all natural and organic. Win. Win. 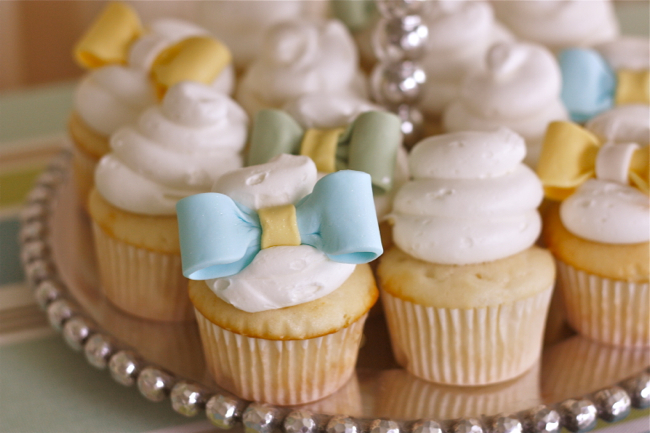 THESE little pretties were quite the hit. I ordered these from Bees Knees Creative on Etsy. Just so happens, Renee lives very close to me and they got here in perfect shape! I just love the shape and the B!!! 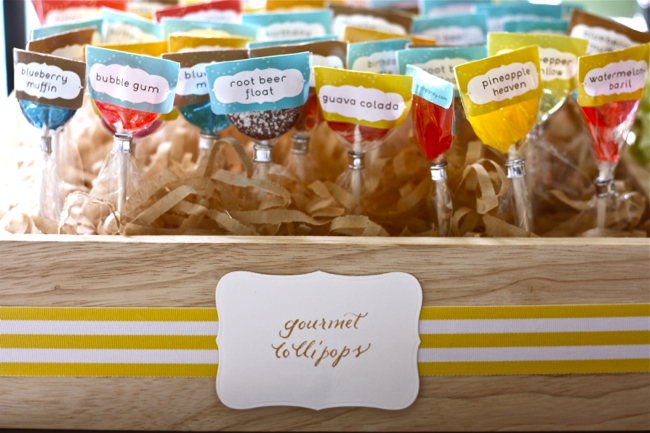 I also wanted to have cute little favors for all of our adult friends (besides the beer that was perfectly positioned in a bed of ice inside Brady’s little red wagon… that’s how we do these parties in the South ; ) I LOVE these little gourmet lollipops from This Charming Candy on Etsy. I’ve used them for a few little projects lately. They have the most fun flavors like Salted Caramel, Root Beer Float, Watermelon Basil and Sweetened Grapefruit. (Plus, they’re just plain CUTE). YUM. It was a rainy day on Saturday, but everything held up. We had the party on our back porch, so we (and the decorations) were protected. There’s the giant (!!!) 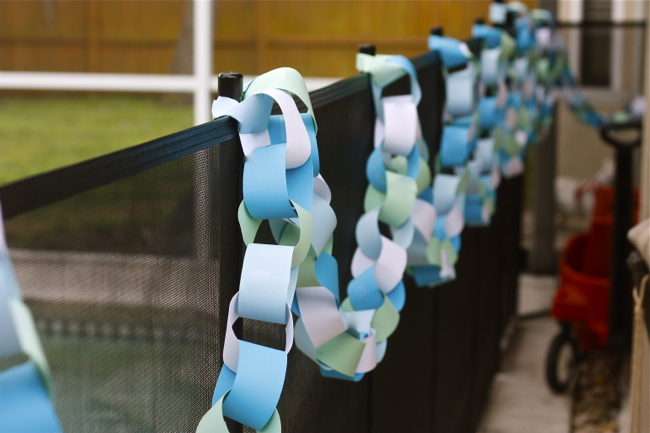 paper chain I made with clearance rack paper from Joann’s. (Want to know how much that chain cost? $4). Yep. There’s a peek at the little red grown-up-beverage filled wagon too. 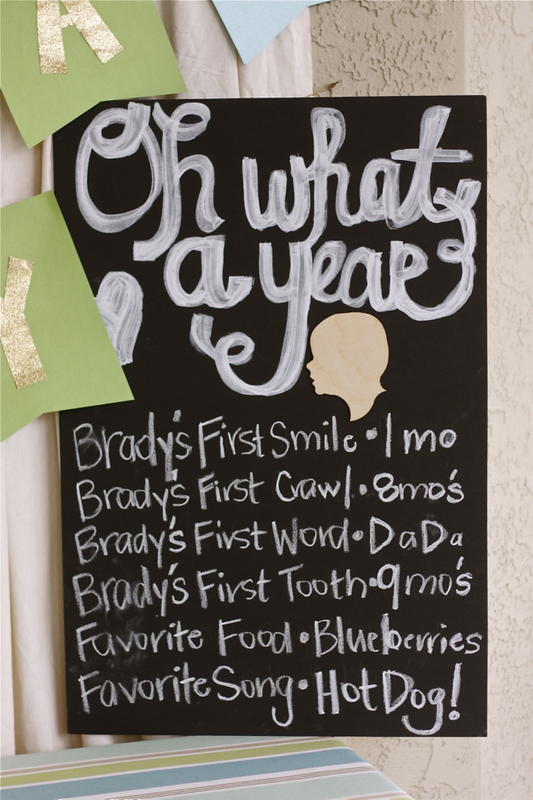 Another “chalkboard” sign proudly displaying a few of Brady’s firsts and favorites. This idea turned out really cute. 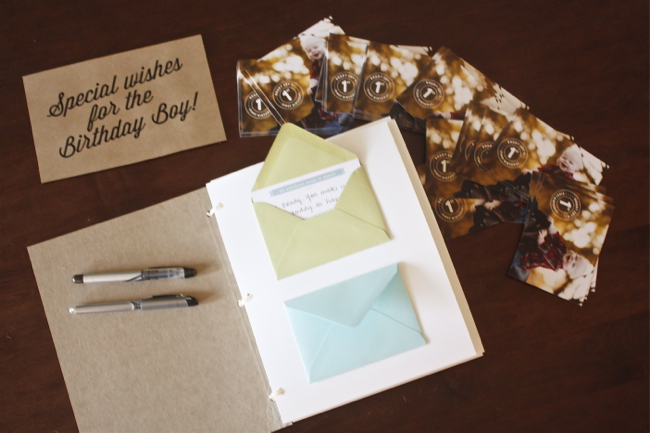 I designed little 3.5 x 5in cards that read “My Birthday Wish for Brady.” Each guest wrote their wishes for him on one and stuck it inside a handmade little book I created with some chipboard, card stock and leftover 4bar envelopes from Paper-Source. I got the card part of this idea from Joni over at Lay Baby Lay and the sweet invitations she designed for her little Vivi. And now, the main event… the delicious, delicious “Southern Picnic” food. Many thanks to my Mom and future-sister-in-law, Taylor, for helping prepare this spread. 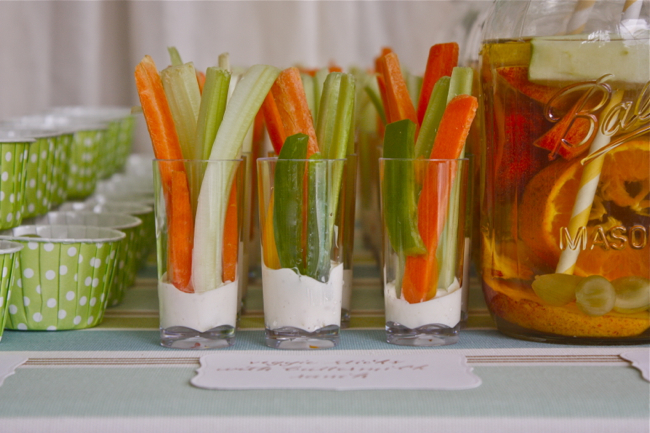 Yummy individual servings of veggie sticks and buttermilk ranch in small glasses. Totally inspired by Pinterest. White Sangria with slices of tangerines, nectarines, green apples, grapes, oranges and lemons. DELICOUS. Paper straws from Hey Yo Yo on Etsy. The mason jars were from my personal stash : ) (every Southern gal has a stash). 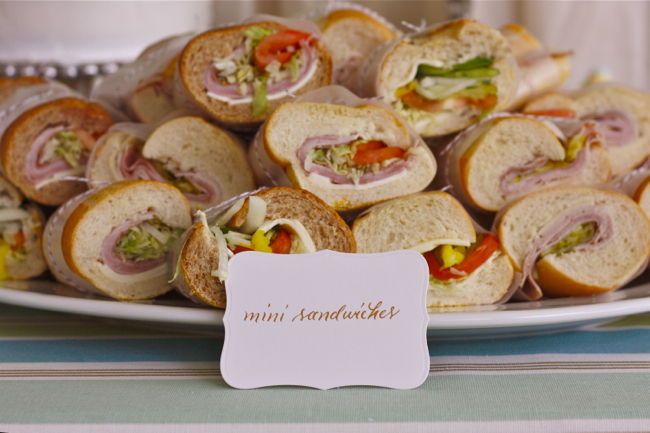 Mini sandwiches as inspired by Southern Living via Pinterest. These were wrapped in strips of wax paper and tied with brown and white baker’s twine. Did I make the sandwiches myself? Heavens no. They came from Publix: cuban sandwiches, club sandwiches and veggie sandwiches. They were YUMMY. I just love all these little pieces all lined up in neat rows. It’s my inner perfectionist. From the left: fruit salad in cute green cups from Sweet Lulu also inspired by Pinterest. 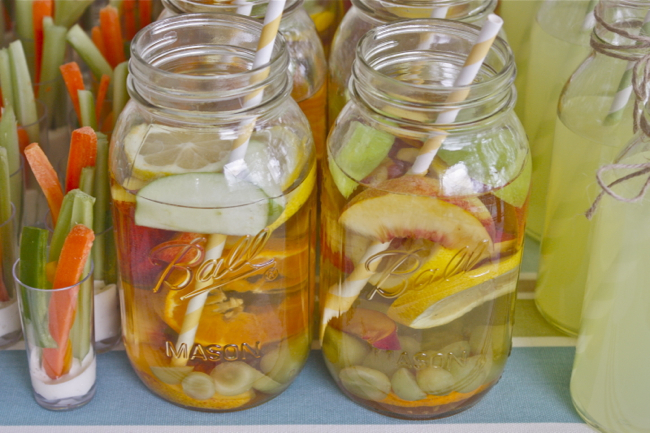 Then the veggie cups, white sangria and lemonade. This photo doesn’t show it, but we used paper straws (green and white striped) in the lemonade next to the yellow and white paper straws in the sangria. 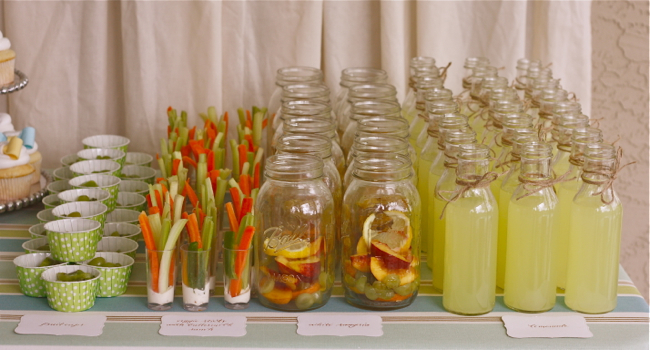 I love the milk bottles we used for the lemonade (with simple twine tied around the necks). The milk bottles came from the same place as the “Bubble” favor canisters: Specialty Bottle. Probably one of my best purchases ever. I plan to use these to many showers, parties and get-togethers to come. At less than $2 each, you can’t go wrong. I really didn’t know how I was going to set the table up until the day of his party. I knew I’d have to see it all and play with it to finally decide how it would look. I ran around my house the morning-of and grabbed random things that felt classic, Southern and young. 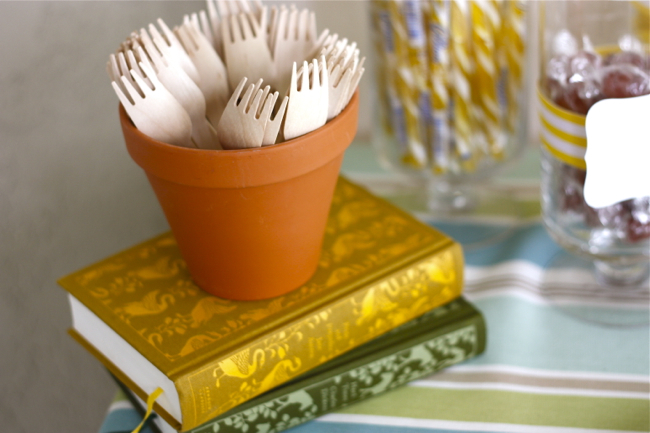 We used this little terra-cotta pot to hold the wooden utensils (LOVE these… they’re from Confetti Sunshine on Etsy) The books are part of my Penguin Classics Clothbound Collection. I’m a little obsessed with these. 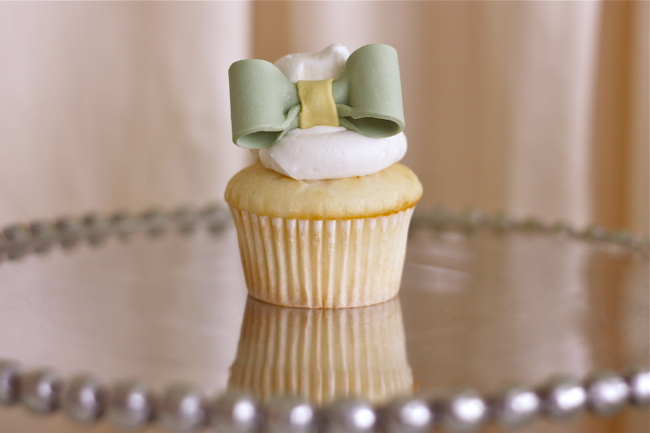 I still cannot get over Brady’s smash cake and bow tie cupcakes. They were made by my sweet friend Dusty (Cupcakes by Dusty). She is one of my favorite people on the planet and most definitely one of the most talented. The cakes were almond flavored (just like wedding cake) and were delicious. I may have eaten a cupcake or two… or three. 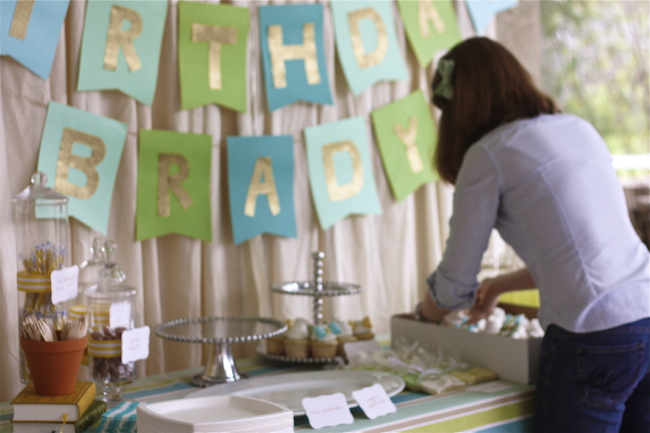 And maybe some of Brady’s leftover smash cake the next day. Oh dear. 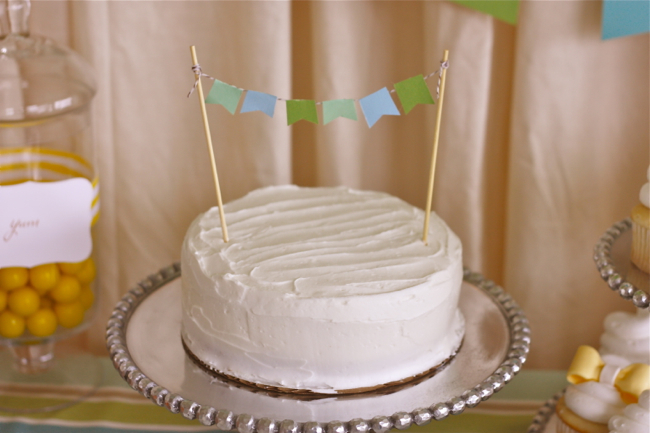 I created the little flag banner on top of the smash cake at the last minute after remembering a Pinterest idea I had. I mean… I still have no words for these. Perfection. Adorable. Love this photo. A sweet little cupcake for my sweet little boy. I can’t believe he’s one year old. We are so blessed to have such amazing friends and family who helped put our little party together and who came over to celebrate with us (and sent sweet wishes for those who couldn’t be with us!) We’re one grateful little family.